The portal won’t be open for much longer! Click here to play! Jump in now if you want to go on the adventure of a lifetime, into a world where fantasy is all that you’ll ever know. Fantasy Realm is an exciting 5-reel slot played across 25 pay lines; more lines activated means more chances for winning combos, and more cash for you! The Elf Queen is Wild, appears on reels 1 and 5 only, and will trigger a Free Game Feature when it appears both times on an active pay line. The Man is Scattered and can not only earn you 200 coins, but can also appear anywhere on the reels in order to earn a payout. If you are looking for straight-up wins, then chase the dragon for up to 3000 times your original bet in winnings. 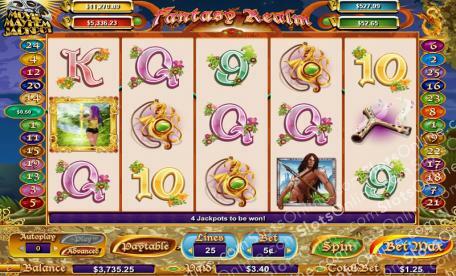 The Fantasy Realm is an exciting journey into the unknown, and with plenty of cash on offer you’ll never want to leave! The Man is Scattered and can show up anywhere on the reels in order to garner a payout. Land all five and you'll be rewarded with 200 coins. The Elf Queen is Wild and can be subbed for any other symbol except Scatters. Land her on reels 1 and 5 for a special Free Game Feature.